Partners Advancing Childhood Education (PACE) is a school readiness initiative funded by the United Way of Greater Atlanta, that provides technical assistance and resources to the 13 counties in Metropolitan Atlanta to address the early learning needs of young children by implementing a parent engagement and school transition program model, coordinating services and advocating for policy and systems change. The vision of PACE is that all children in the 13 Counties of Metropolitan Atlanta are prepared for and successful in kindergarten as a result of engaged families and strong community partnerships. 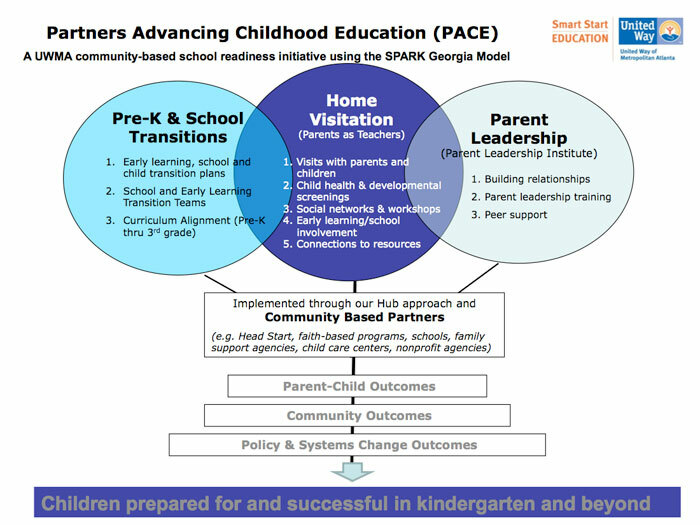 PACE takes its model from SPARK Georgia, a previous school readiness initiative, funded through the W.K. Kellogg Foundation. Through SPARK, Supporting Partnerships to Assure Ready Kids, United Way successfully developed highly-focused partnerships and strategies to help children in DeKalb and Gwinnett counties improve their school readiness skills. These efforts have resulted in increased parent participation and leadership in early education and schools; increased parental awareness of child developmental stages and improved parenting practices; and the creation of School Readiness Councils and KinderCamps to generate dialogue between childcare providers and elementary schools and to familiarize children and families with the transition to Kindergarten. 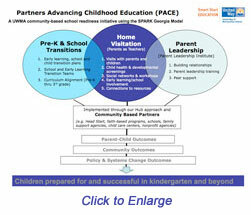 The SPARK GA model serves as a roadmap for the PACE initiative. Traditionally, PACE works by going into targeted areas in metro-Atlanta counties and drawing on the strengths of community-based organizations (e.g. 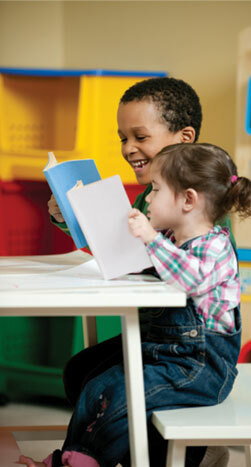 schools, family & social service agencies) in high-needs communities to serve as Community Hubs. Hub staff work with parents, community leaders, schools, early learning centers and various partners to implement the 3 core strategies of home visitation, parent leadership and school transition for children birth – 3rd grade. The 13 metro Atlanta counties where PACE is implemented are Butts, Cherokee, Clayton, Cobb, Coweta, DeKalb, Douglas, Fayette, Fulton, Gwinnett, Henry, Paulding and Rockdale. The venn diagram model shows the interconnectedness of the three strategies and the anticipated outcomes. Home Visitation: PACE uses the Parents as Teachers (PAT) home visitation model as the cornerstone of its home visitation strategy. PAT is an early childhood parent education and family suport program that provides education and training to PACE parents to increase each parent’s knowledge of child development, enhance their parenting skills, link parents with resources and social networks, and conduct health and developmental screenings of children. Parent educators and hub staff that have been trained on the PAT curriculum are responsible for conducting home visits, facilitating group meetings, and administering child development screenings. School Transition: The overarching goal of PACE’s school transition services is to ensure that children and families have a smooth transition into pre-K and the public school system. A unique aspect of the PACE approach is the involvement of PAT Parent Educators in the transition process. PACE school transition strategies include (a) individualized school transition plans for each of the PAT children; (b) school transition teams in the targeted schools to plan and implement school transition activities to engage parents, children, early learning programs, and the community; (c) “Kindercamps” for incoming pre-K and kindergarten students; (d) school readiness screenings; and (e) informational sessions to educate parents about school policies and procedures and to offer tips for preparing their children for a successful day at school. Based on best practices, PACE developed a school transition toolkit which is scheduled to be launched and piloted in the summer of 2015. Parent Leadership: Parent leadership strategies are based on the premise that positive outcomes for children, families, and communities are more likely to occur when parents are involved in the planning and decision making process. Parent leadership strategies include encouraging parents to advocate on behalf of their children; urging them to take on leadership roles in the school and community; asking them to assist with hub programs and activities; and providing the opportunity for them to attend conferences and trainings. The two core parent leadership strategies being used by PACE are Family Leadership Institutes (FLIs) and Parent Cafés. Most recently, PACE piloted a family leadership program in various counties throughout the region. For more information on the Fostering Family Leaders Program, click here. Past hubs have received funding to engage local stakeholders in creating a county-wide Early Learning Plan, implement the PAT home visiting program to enhance parenting skills and link families with social networks and needed resources, improve children’s school readiness skills using research-based developmental screenings and assessments, establish School Transition Teams made up of childcare providers, school staff, parents and community partners to develop transition plans and year-long strategies for rising Pre-K and Kindergarten students, mobilize and support parents to be leaders and advocate for themselves, their children and their community and build grassroots support to advocate for improvements in policy and systems that impact child outcomes.